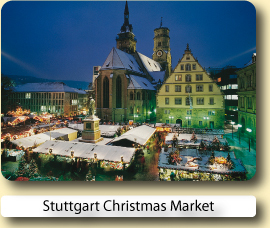 The baroque market square, surrounded by arcades and festively decorated stands has a distinctively warm golden glow during its glorious Christmas Market. Entrance arches and gates are made out of thousands of tiny light bulbs, welcoming visitors to over 170 Christmas booths. Through out the market square, majestic angels spread their glittering wings to bless the scene. You can stroll along the spacious passages from booth to booth and enjoy a festive atmosphere and an amazing variety of impressions. While the young at heart will be attracted by a daily Christmas program, which begins at 7 p.m., the kids will be enthused by a special kiddy program starting at 3 p.m. every day. 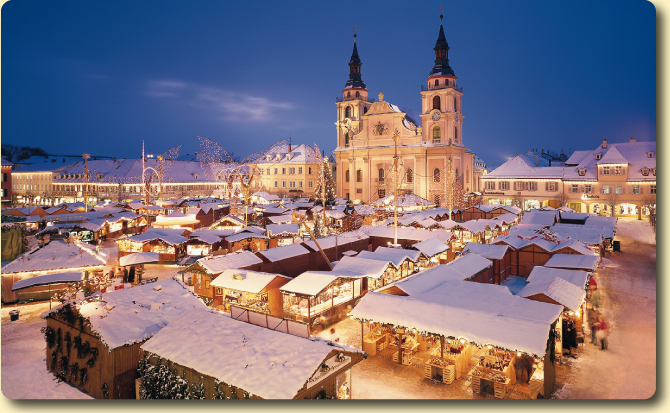 It's not for nothing that the Ludwigsburg Christmas Market is regarded as one of the most beautiful of its kind. 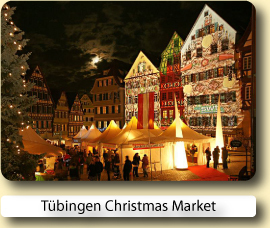 Ludwigsburg during the Christmas season is more than just a visit: the Christmas Market and the nearby pedestrian area with its numerous shopping opportunities will make your Christmas shopping experience a time to remember. 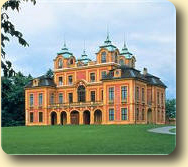 Only 10 minutes from Stuttgart the biggest, greatest and best preserved baroque palaces in Germany are said to be found in Ludwigsburg. The city is said to be the cradle of Swabian poetry and in the past many kings of Württemberg resided here. 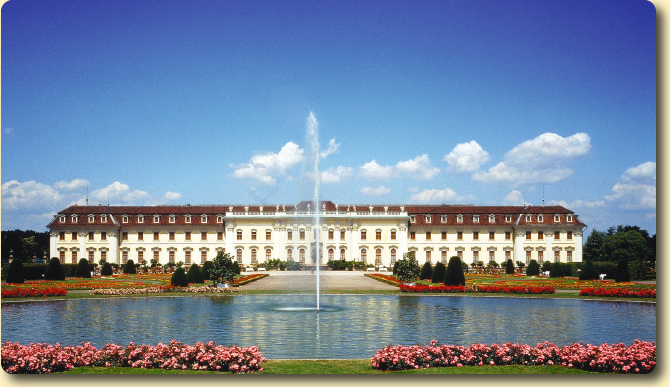 In 1704 the Ludwigsburg area was chosen to become the location for a royal summer residence. Under the rule of Duke Eberhard Ludwig his plans quickly turned into a collection of palaces and a whole new city, this is how Ludwigsburg was born. The main highlight of the city is the magnificent Residential Palace. Not any less attractive are its neighbouring hunting lodge, the summer residence known as Favorite and the Monrepos Lakeside Palace. 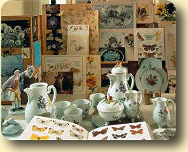 Ludwigsburg also has a long history of manufacturing high quality hand made porcelain products. One of the star attractions for porcelain enthusiasts is the porcelain factory located within in the Palace of Ludwigsburg which was established in 1758 by Duke Carl Eugen of Württemberg. Ludwigsburg is still one of the most important porcelain manufactures in Europe. Using traditional working methods every single item made here is painstakingly designed, embossed and assembled by hand. The decors and paintings are also applied by hand, without the use of any stencils; this is why every piece is unique. Porcelain connoisseurs from all over the world come here to appreciate these beautiful precious pieces of art. Rooms were very nice, hotel was immaculate and in very good order. Staff was very friendly. 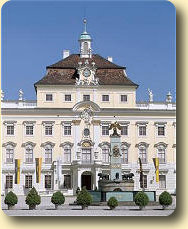 The hotel is minutes away from the Schloss. Staff were efficient, friendly and very helpful, the room was comfortable and very clean and breakfast excellent. The hotel is well located almost opposite the train station. Arriving at the Schlosshotel is always a delight as you drive up to the hotel through the park. The rooms are a little small but very nice and clean. The restaurant is fantastic, the breakfast was really great. Everything was OK, clean, comfortable, breakfast OK, personnel very kind and prompt. 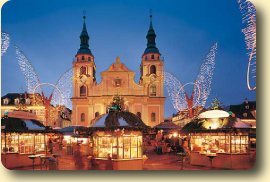 Book your hotel for the Ludwigsburg Christmas Market with Expedia or Hotels.com.Both online reservation services will let you compare and book hotels at great low prices.